On the top floor of an Insurance company office in Southampton, Rod Cousens is planning our future. As the ex-Managing Director of top software house Quicksilva, and the brains behind Soft Aid, the industry’s bid to help the starving in Ethiopia, he is well qualified to do so, some might argue. After a ‘period of exile’, as he puts it, Cousens is all set to launch a new software house, intended to take over where he left off at Quicksilva. Rod Cousens didn’t become involved with micros until 1981, when he was introduced to Nick Lambert and John Hollis, Quicksilva’s original founders. The firm grew steadily and was responsible for a series of innovations — including the use of various ‘labels’ (such as Pixel), and the launch of a separate programming hothouse, Software Studios. The Game Lords club was the brainchild of Loonie-in-residence, Mark Eyles, who also dreamt up the fantasy world of The Faluvian Empire as a backdrop for many of the firm’s games. 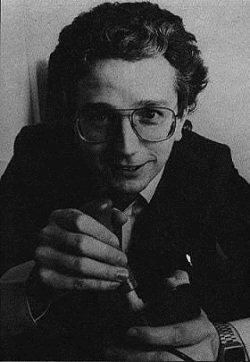 In conjunction with Bug Byte, Quicksilva organised the Quick-Byte spoof award ceremony, at which Clives — busts of Sir Clive Sinclair, like the Oscars in another industry — were forced upon infamous industry figures. These ideas weren’t wholly original, but they were all new to the software industry when they arrived, and demonstrated a professionalism and definite direction which most other software houses lacked. ‘At that time, with the greatest respect to all the other companies, things rather happened by accident — by luck, rather than judgement’, said Cousens. Sadly, much of the pioneering firm’s identity was submerged when Quicksilva was bought by Argus, part of the massive BET group, last year. Cousens explained that the Argus deal came when the original founders of Quicksilva decided they’d had enough: ‘the structure of the industry was stifling their creativity — they wanted a complete break’. After a spell in the West Indies, Lambert and Hollis now live in the Channel Islands. Rod Cousens left Quicksilva a while later, when Argus decided to move the firm to their London offices from Southampton. He attributes the lacklustre performance of the firm since the takeover to the trauma of eight months of negotiation. In view of the crisis that has overtaken the micro industry over the past year, we asked if he had sold out at the right moment: ‘... it may be viewed like that in some quarters — but I don’t necessarily subscribe to that view,’ came the reply. At the beginning of 1985 Rod Cousens came up with the idea for the Soft Aid compilation tape to raise money for starving people. Ironically, the idea came at the Quick-Byte dinner at the London Hilton, when trade magazine editor Greg Ingham asked the industry to raise money for Ethiopia. ‘Like everyone else, I couldn’t fail to be affected by the television coverage of the famine. It seemed to me that the software industry should be in a position, as it projects high technology, to assist Third World countries. Band Aid is not the only point in common between the software and music industries. Software is subject to its own fashions and hype; it has its own stars, and its own subculture. At one point it was even reported that Rod Cousens was to become a Pop Star! ‘I was flattered — if someone wants to write a hit record for me then, if it’s profitable, I’ll contemplate it.’ The story probably stemmed from a bizarre Quicksilva launch hosted by Radio One DJ Anne Nightingale, at which a piece of music entitled The Game Lords was premiered. ‘I don’t think my voice is that acceptable’, Rod admitted. I asked him if it was fair to compare music and game publishing. ‘In certain quarters, certainly. The software industry has now taken on charts, which do have an effect on the consumer, whatever their shortcomings.’ It was telling to hear him speak of the charts leading the buyers, rather than vice versa. His new firm may well surface under the name Electric Dreams at the Personal Computer World Show this month. Programs will be chosen for release by Paul Cooper, formerly Quicksilva’s Software Editor — as Rod prognosticated, Paul sat in the background, chortling his way through a copy of the August issue of CRASH. In view of his past contacts, it would hardly be surprising if a few famous names from Quicksilva made their mark on the new label. It’s been twelve months since the last program from Ant Attack author, Sandy White, hit the streets for example.